Making arrangements for any amplified sound (speakers, microphones, etc.) that may be required for the marriage ceremony. Before the Wedding, Clients are responsible for applying for and obtaining a valid marriage license in the jurisdiction where the marriage ceremony will be performed. Clients understand that the Officiant will not perform a marriage ceremony without a valid marriage license presented to the Officiant at the Wedding and prior to the Wedding Ceremony Start Time. By entering into this Agreement, Officiant undertakes no obligation to obtain or assist with obtaining a marriage license for Clients. If Officiant does not perform the marriage ceremony due to Clients failure to provide Officiant with a valid marriage license at the prior to the Wedding Ceremony Start Time, Officiant’s failure to perform the marriage ceremony shall not constitute a breach of any term, condition or obligation owed by Officiant under this Agreement. If Clients are legally married prior to Officiant’s performance of the marriage ceremony, Clients will provide a copy of the filed marriage license to the Officiant prior to the start of the marriage ceremony. Vow renewals and commitment ceremonies do not require a marriage license. This Agreement is valid only for the Wedding Date, Wedding Ceremony Start Time, and Wedding Location as selected. If Clients reschedule the Wedding Date, Wedding Ceremony Start Time, and/or Wedding Location, written notice must be given to the Officiant of Clients’ intention to reschedule and if known, identify the new date, time, and/or location for the marriage ceremony (“Rescheduled Wedding”). Clients understand that the Officiant cannot guarantee his/her availability to perform the Services for Clients at the new date, time, and/or location for the Rescheduled Wedding. If Officiant is available to perform the Services for the Rescheduled Wedding, Clients may incur additional fees for Officiant’s Services. At Officiant’s discretion, the Parties may enter into a separate written agreement or modify this Agreement to reflect the Rescheduled Wedding. If Officiant is not available to perform the Services for the Rescheduled Wedding, it is to the discretion of the officiant if the monies will be refunded. This Agreement will become effective once this agreement is acknowledged and payment is received. The date a Party terminates the Agreement as provided below. all outstanding Officiant’s Fees for Services and Additional Services rendered through the date of termination will be due immediately. Termination 60 calendar days or less from the Wedding Date will require that Officiant’s Fees be paid in full at the time of termination. Officiant, without cause, may terminate this Agreement by delivering written notice to the Client. If Officiant terminates this Agreement, the Officiant will refund all Officiant’s Fees received from Clients. If a dispute arises under this Agreement, it shall be settled exclusively by submitting to a mutually agreed-upon arbitrator in Honolulu, Hawaii. Judgment upon the award rendered by the arbitrator may be entered in any court having jurisdiction to do so. Costs of arbitration, including attorney fees, will be allocated by the arbitrator. IN RECOGNITION OF THE RELATIVE RISKS AND BENEFITS OF THIS AGREEMENT TO BOTH THE CLIENTS AND THE OFFICIANT, THE RISKS HAVE BEEN ALLOCATED SUCH THAT THE PARTIES AGREE TO LIMIT THE LIABILITY OF EITHER PARTY TO THE OTHER FOR ANY TYPE OF DAMAGES TO THE AMOUNT OF OFFICIANT’S TOTAL FEES UNDER THIS AGREEMENT. IT IS INTENDED THAT THIS LIMITATION APPLY TO ANY AND ALL LIABILITY OR CAUSE OF ACTION HOWEVER ALLEGED OR ARISING, UNLESS OTHERWISE PROHIBITED BY LAW. HOWEVER, EACH PARTY WILL REMAIN LIABILE FOR BODILY INJURY OR PERSONAL PROPERTY DAMAGE RESULTING FROM GROSSLY NEGLIGENT OR WILLFUL ACTIONS OF THE PARTIES. All notices, requests, claims, demands and other communications between the Parties shall be in writing. All notices shall be given (a) by delivery in person, (b) by a nationally recognized next day courier service, or (c) by first class, registered or certified mail, postage prepaid, to the address of the Party specified in this Agreement or such other address as either Party may specify in writing. Such notice shall be effective upon (a) the receipt by the Party to which notice is given, or (b) on the third day following mailing, whichever occurs first. Notice may also be given by facsimile or electronic mail. Such notices shall be effective upon receipt of a written acknowledgement by the Party to which notice is given. This Agreement contains the entire agreement of the Parties and there are no other promises or conditions in any other agreement whether oral or written. This Agreement supersedes any prior written or oral agreements between the Parties. This Agreement may be modified or amended if the amendment is made in writing and is signed by all Parties. If any provision of this Agreement shall be held to be invalid or unenforceable for any reason, the remaining provisions shall continue to be valid and enforceable. If a court finds that any provision of this Agreement is invalid or unenforceable, but that by limiting such provision it would become valid and enforceable, then such provision shall be deemed to be written, construed, and enforced as so limited. The headings contained in this Agreement are strictly for convenience, and shall not be used to construe meaning or intent. The failure of any Party to require strict compliance with the performance of any obligations and/or conditions of this Agreement shall not be deemed a waiver of that Party’s right to require strict compliance in the future, or construed as consent to any breach of the terms of this Agreement. The Officiant shall not be liable for any failure of or delay in the performance of this Agreement if such failure or delay is due to causes beyond its reasonable control, including but not limited to acts of God, war, strikes or labor disputes, embargoes, government orders or any other force majeure event. Upon occurrence of any force majeure event, the Officiant shall give such oral or written notice (as reasonable under the circumstances) to the Clients of its inability to perform or of delay in completing its obligations. This Agreement shall be governed by the laws of the State of Hawaii, and any disputes arising from it must be handled exclusively in the federal and state courts located in County of Honolulu, Hawaii. 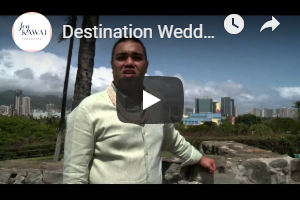 Best Hawaii officiants for your wedding. No more hours of internet surfing. No more back and forth emails.